Discussion in 'Wheels, Tyres, Brakes & Suspension' started by C240Sport97, Apr 15, 2019 at 1:27 PM. fitted 4 new Goodyear F1 Assymetric 3s last week. 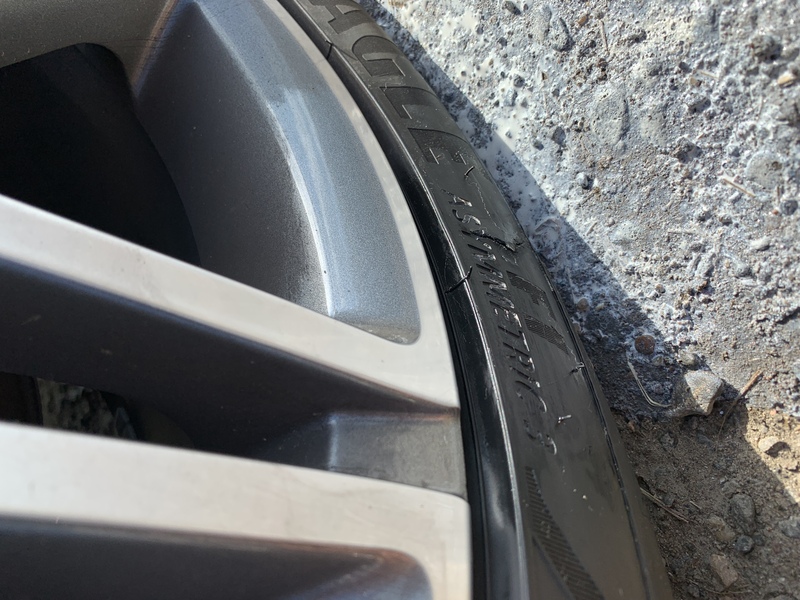 A few days later, the sidewall developed a leak - there is no damage to the outside sidewall so I am thinking it’s a defective tyre. See pic. Advice on who to contact at Goodyear to get reimbursement for replacement would be much appreciated. Surely the responsibility is with the supplier initially. markjay, stwat and whitenemesis like this. I know you say there’s no damage, but from the picture it looks damaged, like it could have caught a pothole or something like that? Bad luck either way for a new tyre - hopefully Goodyear or the supplier can help further? Yeah looks like it’s been damaged by an external factor. if there was an external impact, you would expect bits of rubber to missing .. there aren’t any, it’s merely a lose flap. First call should be with the tyre shop that fitted them. They can then inspect the tyre and take it from there. As in it’s been thrown away? Something sharp on the road surface? Shame MB have dumped the tyre, as I’d expect Goodyear would’ve wanted the old one back to inspect. Without the tyre I'm afraid you've got next to no chance of anybody giving you a refund. brain freeze on my part .. should have remembered to ask them to put old tyre in the boot! Did MB Perth fit the tyre last week and have they replaced it free of charge? If so then surely they will return it to their supplier. That's hit something. If not a kerb then something in the road. It's not concurrent with damage during fitting. E55BOF and DrFeelgood like this. I could be wrong but I’d have thought a tyre would either deflate slowly (in the case of a puncture) or in the case of a blowout would be a more dramatic loss of pressure. That looks like something has gone into the sidewall causing the tyre to go flat, if it had burst under pressure I’d have thought you’d have known about it?